The Aldergrove-based Clothes2U organization is celebrating their 15th anniversary this month of giving clothes, toys, linens, diapers, personal and small household items free to those in need. “What was originally intended to be a one time thing has blossomed into helping people throughout the year and in many communities across metro Vancouver and the Fraser Valley,” said spokesman Ernie Jantzen. 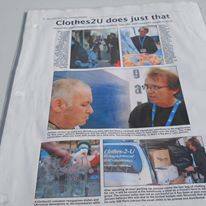 Clothes2U will be holding its next event at Nicomekl Elementary School, 53 Ave. at 200 St. in Langley on Saturday, Sept.30 from 10 a.m. to 12:30 p.m. Admission is $1 to get in, everything on the tables is free and Clothes2U ensure a fair distribution by monitoring amounts taken. Copyright © 2019 Clothes 2u. All Rights Reserved.